Korokke Teishoku and Ginger Pork Teishoku with a side order of Grilled Mackerel. Contrary to popular belief, the Japanese do not live off a steady diet of ramen, sushi, and tempura (although I wish!). 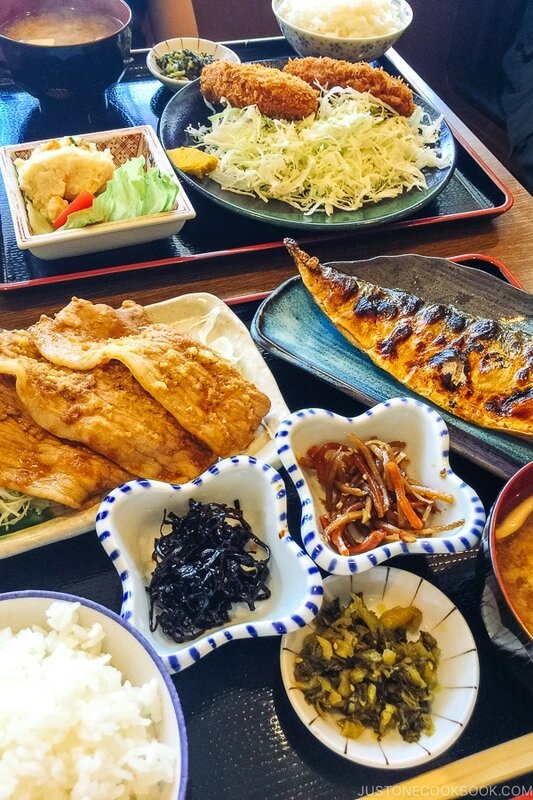 Japanese cuisine/Washoku is actually quite simple and a nutritious balance of protein and vegetables served each in its own plates and bowls. Called Ichiju Sansai (一汁三菜), literally “one soup three dishes,” this is the foundation of a Japanese meal. 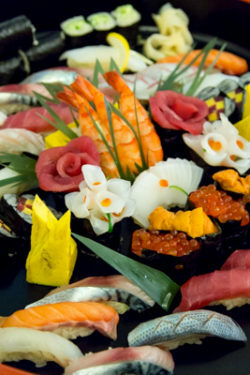 A typical Japanese meal is composed of four elements: rice, soup, side dishes and pickled vegetables. This meal format can be served for breakfast, lunch or dinner. 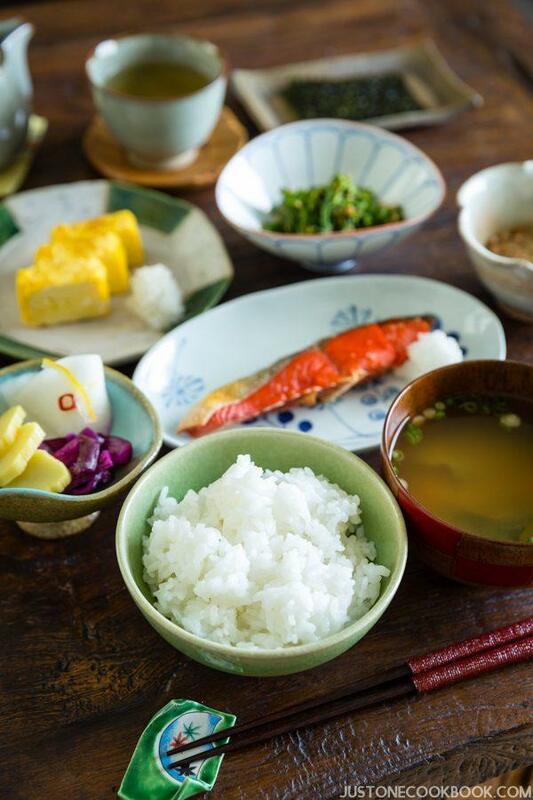 If you’ve been fortunate to spend a night at a ryokan (Japanese inn), you may have witnessed the elaborate spread of dishes for breakfast. 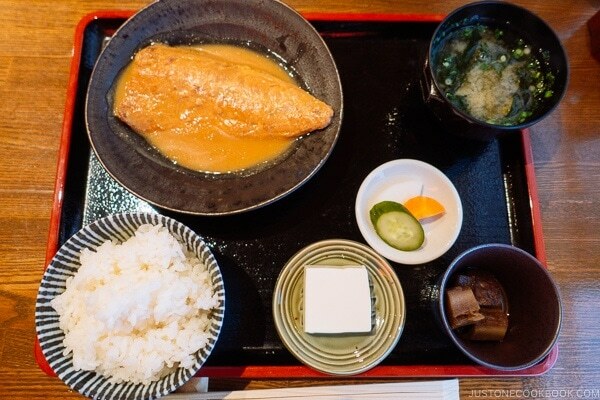 Or perhaps you may have encountered something similar in the form of a teishoku (set meal on a tray) at Ootoya Restaurant (the Japanese chain restaurant) or other places. Ichiju Sansai – Where Did It All Begin? 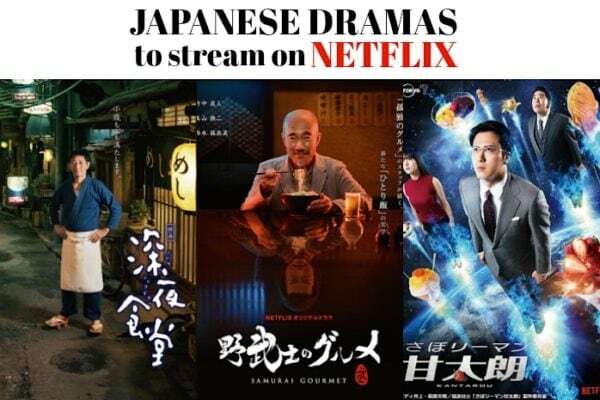 The style of “one soup three dishes” originates from Honzen Ryori (本膳料理), a highly refined system of meal-serving that was established as a banquet style of the upper nobility and the samurai class during the Muromachi period (1336–1573). 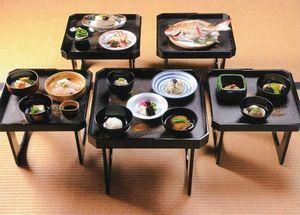 The elaborate dishes were arranged and brought to the guests on small four-legged tray tables called “zen” (膳). The tables would be presented to the guests in sets of three, five, or seven, starting with the main “zen” (Hon-zen 本膳), second “zen” (Nino-zen 二の膳), third “zen” (Sanno-zen 三の膳) and so forth. 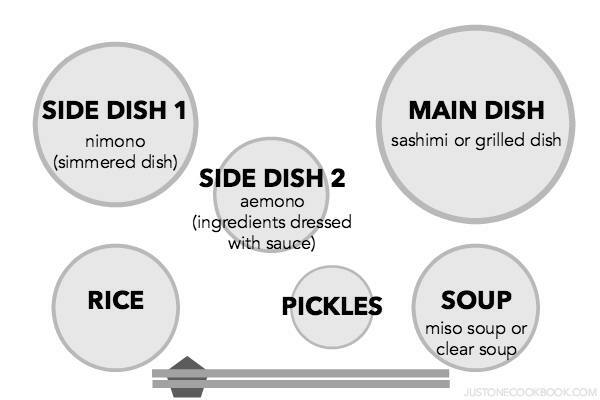 Wondering why there’s no mention of rice or pickles in the Ichiju Sansai (One Soup Three Dishes) setup? 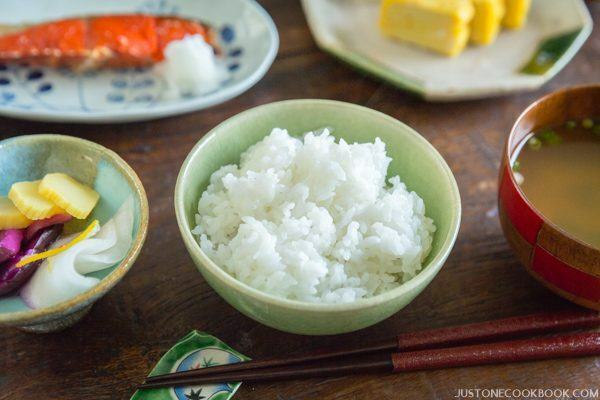 This is because rice and pickled vegetables are always included in a Japanese meal. Rice is not only a dish in itself, but it is also an essential component in the national cuisine. It also has a symbolic place in the Japanese language: the term Gohan (ご飯) means both “cooked rice” and “meal.” The sticky short-grain Japonica rice is the heart of a Japanese meal, and also the staff of life. It’s also a necessary ingredient in Japanese cuisine. Koji (麹) mold culture injected into steamed rice is an essential ingredient in making Sake, Mirin and Miso. So let’s get started! 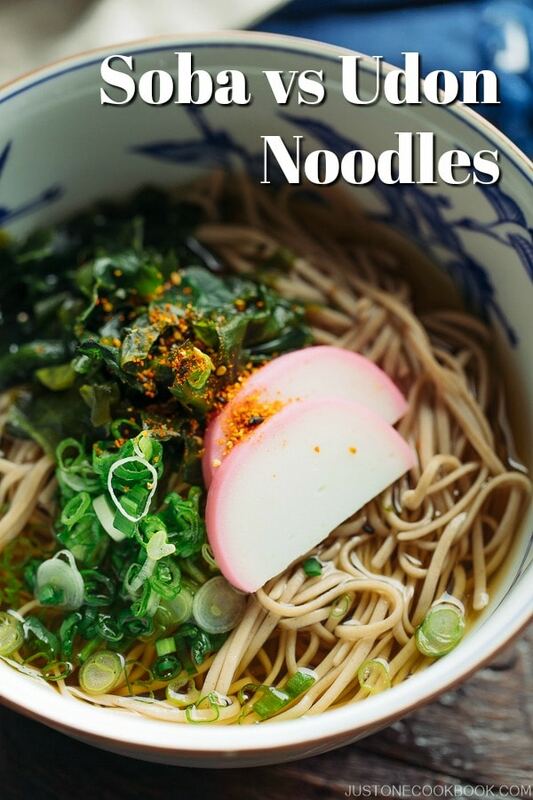 Ichiju Sansai is just a structure, so even if you’re vegetarian, pescatarian, vegan or have dietary restrictions, you can easily swap and adjust recipes to suit your dietary needs for a filling meal. Browse through the recipes below to pick out what you want to cook! Traditionally, rice would be served plain. But if you’re seeking for flavor and color in your rice, try Takikomi Gohan (炊き込みご飯), rice cooked with vegetables and seasonings. Cleansing your palate between a meal may sound a little strange at first, but with all the different textures and flavors going on, it’s actually refreshing to reset your mouth from time to time. 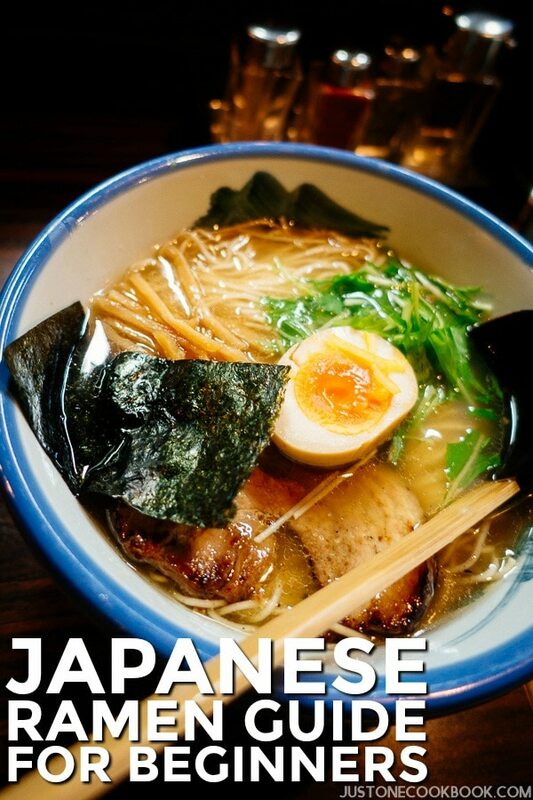 A soup is not just a side dish, but it holds its own place in a Japanese meal. Miso soup is most commonly served, but feel free to serve whatever you wish! As eating meat became popularized only during the last 150 years, traditionally the main protein would be fish, either grilled or simmered. 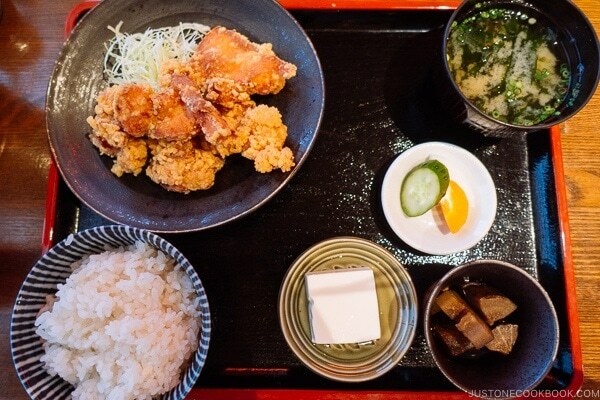 But nowadays, you’ll see fried foods such as Tonkatsu or Karaage, or even Gyoza as the main protein. Vegetables are served in cooked form and not served raw. Ichiju Sansai is just a format, so don’t worry if your meal doesn’t look perfect with all the correct number of dishes. The point is to have a well-balanced meal of protein, vegetables and carbohydrates. Lastly, please let us see of your Ichiju Sansai meals by posting your photos on Instagram with the hashtag #justonecookbook! I learned about the above when I began studying Japanese and it reminded me how similar it is to the way, in Egypt, the Arabic word used for bread is “aish” (عيش) which literally means “life”, as opposed to the standard word for bread, khobz (خبز), used by other Arabic speakers. The linguistic symbolism similarly highlights the centrality and significance of bread in Egyptian food and lifestyle. I find it interesting to point out and compare these linguisric and cultural parallels. Interesting to hear about the linguistic similarities of the terms for food/life. It shows how much food is central to every culture! A very refreshing post. I had to travel to Japan with my husband ( who is native Japanese) to learn how to properly serve ichijusansai. This is an important point that most of my translated Japanese cookbooks leave out. Before Japan, I served only misoshiru, a main protein, one vegetable, oolong cha or genmaicha, and gohan (my husband hates tsukemono). After staying with my wonderful in-laws in Chiba , and later visiting Kyoto, I learned by the examples of other cooks just how many set combinations there are! Anything is possible, even using leftovers to make okazu for other meals is acceptable. 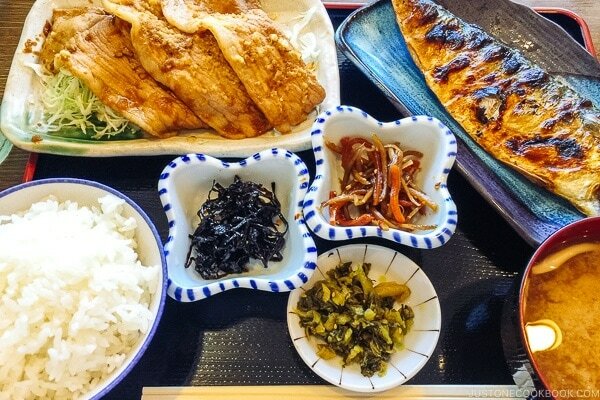 Glad to hear that you’ve been able to incorporate Ichijusansai into your meal plan! 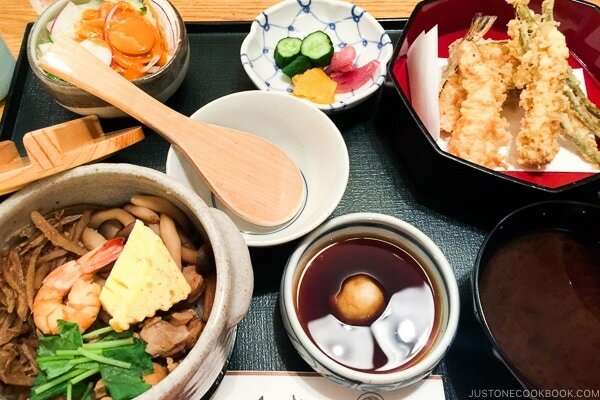 Ichiju Sansai is quintessential Japanese home cooking. Alas sometimes we just do not have the time, but when we do there’s something just so right, so balanced and comfortable about this. To be honest, I didn’t know it had a name! 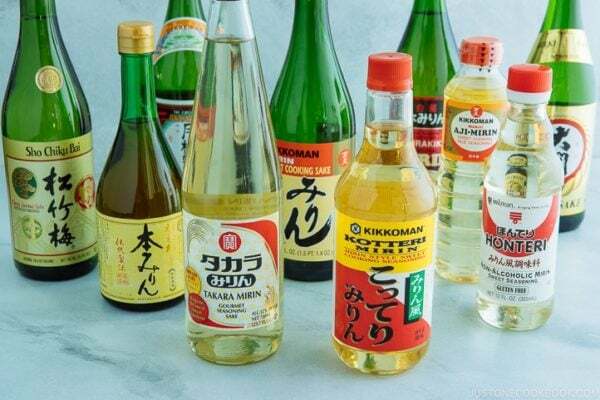 Ichijusansai isn’t a term we use daily, so no worries that you didn’t know it had a name! It’s just something we take for granted. 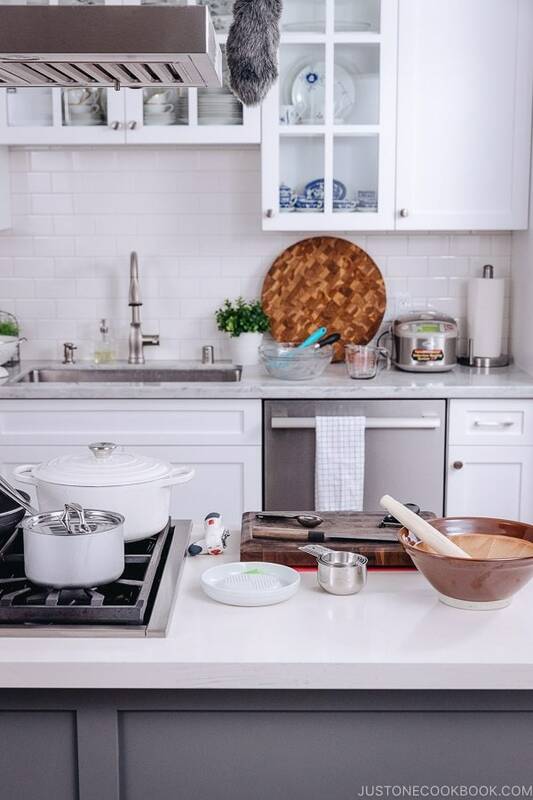 Agreed, there is something comforting in the balance of the dishes. Konichiwa–I lived in Tokyo on an A=USAF base as a kid. One thing I loved was the sweet rice cakes we had on New Years-Mochi? The ones I find are frozen and not what we had. Where can I get them or make them? You should be able to find dried mochi in Asian or Japanese supermarkets, see this list for a grocery near you. 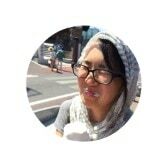 Have you checked out Nami’s recipe? Making mochi at home will require tools that aren’t easy to buy, you need to pound steamed mochi rice, and most Japanese people buy the dried ones and toast them at home. Good luck! Preparing a 一汁三菜 meal may seem daunting, especially if you want to prepare it on a daily basis. But there are a few tips that could hopefully ease the burden. – There’s no need to prepare everything from scratch for every single meal! Make large batches of a side dish (like Kinpira or Hijiki) and don’t be afraid of serving leftovers the next day. These types of dishes also keep well for a few days. – Prepare simple side dishes, like chilled tofu or a daikon salad. I always keep tofu at hand. – You can always freeze leftover rice and microwave portions the next day. No need to cook rice at each meal. The point is to keep it simple! 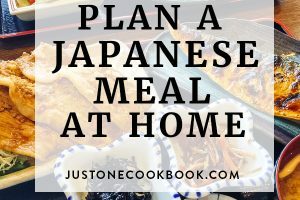 You can always start with making one hearty main dish (like a stir fry) with rice and miso soup, then once you feel comfortable, prepare another side dish. First, I want to say I love your site. I’m slowly working through the recipes, finding things we all like (not always easy with picky eaters!). I was curious about two things. Is there a specific position the many dishes should be put in when you set the table? Second, I don’t have upper teeth (and, for the moment, my denture isn’t an option). Do you have good soft food suggestions? The rice, most fish, and soups, of course, are pretty easy. But a lot of vegetable dishes I’ve found so far are crunchy, which is hard on the gums. Thank you for the work you do here! It’s a wonderful resource! Thank you for your comment! As the author of this article, I’ll respond to your question on the plate placement. If you scroll up to the image below “What is Ichiju Sansai?” you’ll see where to place the various plates and bowls. I’ve also covered the topic on why the rice bowl is placed on the left in my other article, “Japanese Dining Etiquette 101 (Part 2)” under “Where should the bowls of rice and soup be placed?” If you haven’t already, please check that out! Hi Katy! First of all, we just found your comment not being answered. We apologize for our late response. We’re really happy to hear you enjoy our website. Thank you! As for the softer vegetables, I agree with Kayoko on boiling/blanching, simmering, steaming, stir-frying vegetables. Usually, leafy vegetables don’t taste good when it’s over-cooked (when it gets too soft and mushy). However, root vegetables like daikon and kabocha may be a wonderful choice as when they are simmered in broth, it tastes delicious and it has a lot of nutritious values as well. Thanks for your response, Katy! Enjoy! Wonderful information! thankyou so much for explaining the japanese food system…it seemed so daunting and confusing but now I understand how it is utilised and “what goes where”. Arigatou gozaitmashita!